Photo provided by the Office of U.S. Sen. David Vitter, R-La. 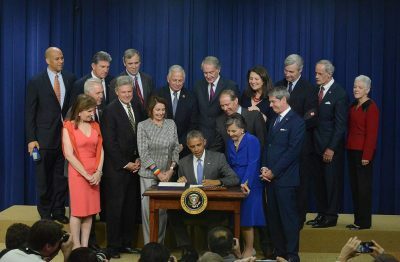 Norfolk, VA – CozyPure, makers of organic mattresses and bedding, applauds President Obama for signing the Frank R. Lautenberg Chemical Safety for the 21st Century Act into law earlier this week. The law, which updates the Toxic Substances Control Act of 1976, will do a better job of reviewing chemicals currently in the products Americans buy for their homes as well as regulating new chemicals before they are introduced to consumers. When the original law was passed there were already 62,000 chemicals on the market but the restraints placed on the EPA made it nearly impossible to ban them. In fact, due to proprietary trade secrets only five of the 62,000 chemicals have been banned in the 40 years since the law’s initiation. “Folks should have the confidence to know the laundry detergent we buy isn’t going to make us sick, the mattress our babies sleep on isn’t going to harm them,” Obama said. “For the first time in our history, we’ll actually be able to regulate chemicals effectively. And we’re doing it in the same, overwhelmingly bipartisan fashion,” the president said. The new bill emulates the stance that CozyPure has always taken on the products they manufacture and sell to consumers made only from natural ingredients such as rubbermilk, wool and organic cotton versus similar mainstream products made from plasticized polyurethane foams and undisclosed, potentially toxic chemicals often coated in flame retardants. In 2007 a huge milestone was reached when PBDEs, a widely used set of toxic flame retardants, were finally phased out. According to an EPA report in August 2015, the new substitute chemicals are now also cause for concern. This new legislation should hopefully eliminate the instances where one harmful chemical is replaced with another.